Argentine Radio Host Will Avoid Criminal Prosecution By Discussing Gender Issues Angel Etchecopar, commonly known by his nickname "Baby Etchecopar," was charged with sexist discrimination. Now, he must host experts on gender — and let guests speak uninterrupted. The demand that an Argentine radio show host start hosting programming about gender issues comes against a backdrop of debate about sexism and women's rights in Argentina. In this photo taken in June, pro- and anti-abortion demonstrators are seen outside the Congress building in Buenos Aires. An Argentine radio show host who faced criminal prosecution for allegedly sexist remarks has struck a deal. In lieu of a more punitive route, prosecutors have ordered a five-month education in gender issues for Angel Etchecopar, commonly known by his nickname "Baby Etchecopar," and the listeners of his noontime radio program, El Angel de Mediodia. According to Argentina's La Nación, the deal states that once a week, for five months, Etchecopar will have to host a specialist in gender issues on his show. And he'll have to let each specialist speak, uninterrupted, for 10 minutes, with no room for criticism afterwards. Prosecutor Federico Villalba Díaz told La Nación that Etchecopar's comments rose to a criminal offense in the first place because prosecutors were able to collect eight pages of "derogatory, insulting, offensive, degrading and discriminatory" statements he had made. But he said Etchecopar's willingness to change led prosecutors to drop the criminal case in favor of this more creative solution. Villalba Diaz told the French newspaper Le Monde that he felt it important for Etchecopar's listeners to be exposed to new voices. The idea "promotes tolerance," he said. Prosecutors will provide Etchecopar with a list of interviewees for the five-month term of the deal, which begins in March. And, according to La Nación, special prosecutor Verónica Guagnino, who specializes in gender-based violence, will set the agenda for Etchecopar's conversations with the provided gender experts. In addition to changing the content of his show, Etchecopar reportedly had to issue a public apology and make a small charity donation as part of the deal. And La Nación reports that if Etchecopar violates discrimination laws again within a year, the agreement will be terminated and he could be criminally prosecuted. The deal comes against a backdrop of larger debate about sexism, feminism and women's rights in Argentina. 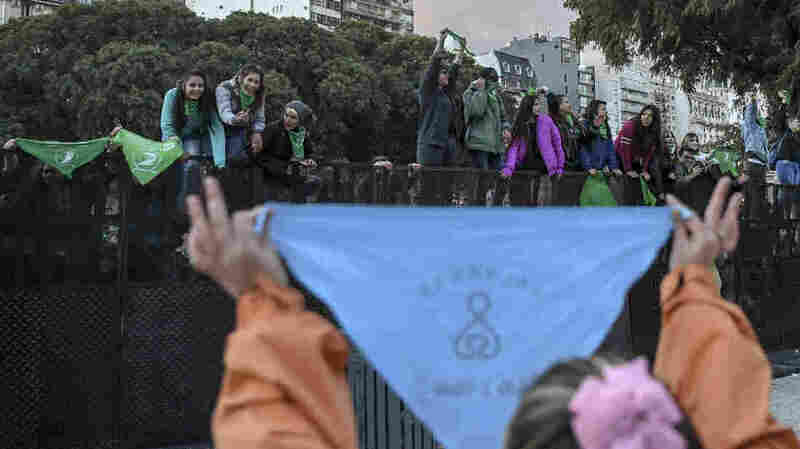 Over the summer, NPR's Jasmine Garsd reported on a popular daytime talk show in Argentina, "Intrusos," that became an unexpected platform for discourse about feminism and women's issues in the lead-up to a vote on a bill legalizing abortion. Garsd reported that Jorge Rial, the host of "Intrusos," refers to himself as a recovering misogynist. But the transformation of "Intrusos" was not ordered by prosecutors. It was about ratings, according to the show's producers. The debate over abortion – and feminism more broadly – had the country captivated. In August, Argentina's Senate rejected the bill, which would have legalized abortions during the first 14 weeks of pregnancy. The vote was close; the bill was defeated with 38 no votes and 31 yes votes.